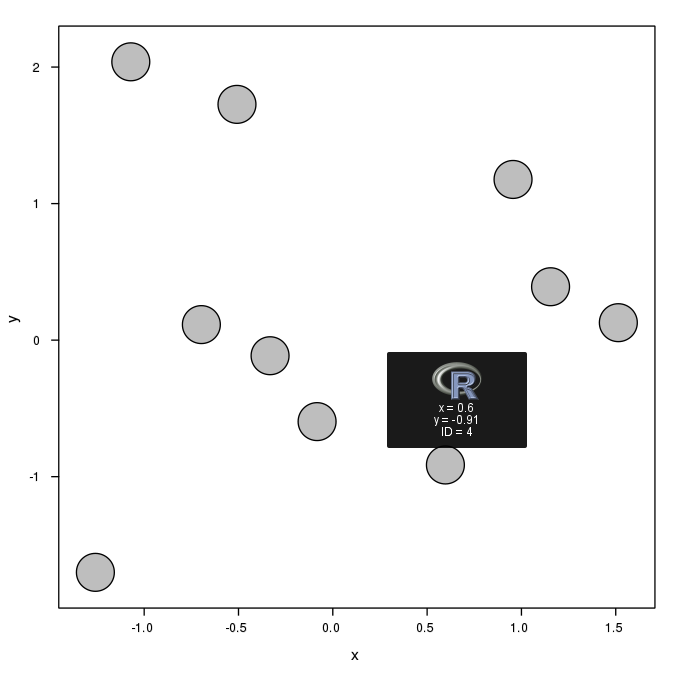 Tooltips with R and jQuery | Omnia sunt Communia! EDIT: There is an updated version of the code below that use both qTip2 and tooltipster. The code is available at github. Visit the result with qTip2 and with tooltipster. Anyway, the procedure illustrated below is still valid. The first step is to produce the graphic. We will use a custom panel function which assigns unique identifiers to each element. The tooltipster plugin will use the content of the title attribute of each element to show the tooltip. Therefore we visit each circle to add content to the title attribute with grid.garnish. ## Each circle is identified with myPoint.1, myPoint.2,etc. Save this code in a file named myTooltipLattice.js (for example) under the js/ folder. Then you can add it to the graphic with grid.script. Last step is to produce the SVG file and include it in a basic HTML page. If you wish you can change the title of this page and modify the tooltip CSS configuration using the tooltipster.css file (included in the tooltipster plugin). The result is available here. Very nice post by the way! Hi. It wasn’t working for me either. But, manually editing the 5 links in the tooltipLattice.html directly to end “>” instead of “/>” makes it work fine. If that makes any sense. Using Chrome 21.0.1180.89 m.
That comment didn’t post very well. The first quoted text shoud read “\>\”. Hopefully the should be visible in this comment now. Nope – commenting about HTML tags is hard! Right … “script” at the end with around it, and a / before “script” ! I have just edited the post with links to updated code using a different plugin (qTip2). I have checked it with Chrome and it works. Not sure qTip2 is needed. In the end, rather than use grid.script (which places the tags inside the SVG) I put the tags for the 3 .js files into the htmlEnd outside the SVG and then tooltipster and the code in this post works great. Ok, interesting. I think I must contact Paul Murrell about this. The code should also work correctly with chrome using grid.script. Do you get any error message? Have you tried with a different browser? Do the examples of the work for you?